CHRIS BENNER is the Dorothy E. Everett Chair in Global Information and Social Entrepreneurship, Director of the Everett Program for Digital Tools for Social Innovation, and Professor of Environmental Studies and Sociology at the University of California, Santa Cruz. 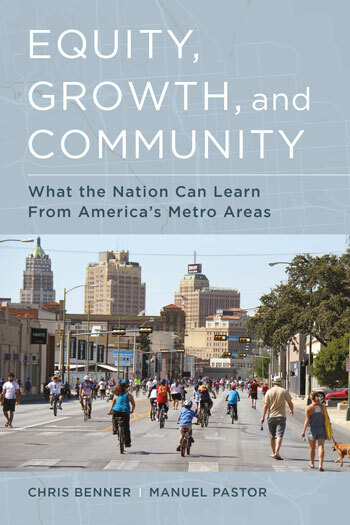 His most recent book, coauthored with Manuel Pastor, is Just Growth: Inclusion and Prosperity in America’s Metropolitan Region. His other books include This Could Be the Start of Something Big: How Social Movements for Regional Equity Are Transforming Metropolitan America and Work in the New Economy: Flexible Labor Markets in the New Economy. MANUEL PASTOR is Professor of Sociology and American Studies and Ethnicity at the University of Southern California, where he also serves as Director of USC’s Program for Environmental and Regional Equity (PERE) and Codirector of USC’s Center for the Study of Immigrant Integration (CSII). He is the coauthor of Uncommon Common Ground: Race and America’s Future and This Could Be the Start of Something Big: How Social Movements for Regional Equity Are Transforming Metropolitan America. Driving That Train: Can Closing the Gap Facilitate Sustained Growth? Looking Forward: A Beloved (Epistemic) Community?